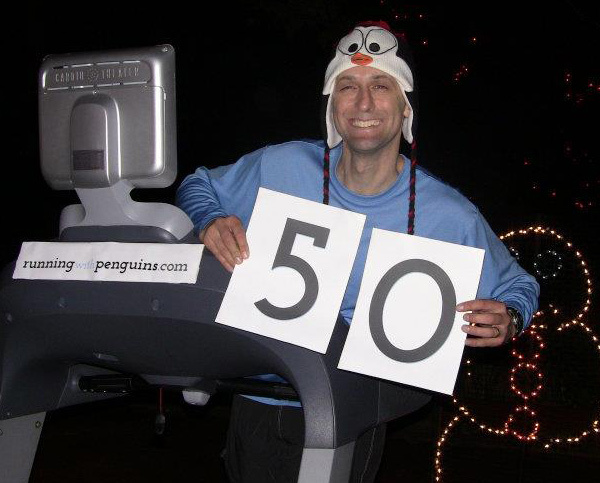 Running 50 miles is a chore, yes, but it is a task made much easier when surrounded by friends, well-wishers, the incredible Zoo staff and of course, the wonderful penguins! A sense of community and purpose resounded from the birdhouse Saturday. I feel privileged to have been a part of it. I began the day at 9:20 AM and finished up at 8:30pm. Through 5pm, I was inside the birdhouse right near the irresistibly cute penguins. I narrated the penguin feedings, joked with visitors, talked to the media and thoroughly enjoyed all the fantastic, inspiring artwork done by children. Later, I moved out to the main courtyard and finished up the run along with the jolly crowds enjoying Lights at the Zoo. I finished in just over eleven hours and honestly enjoyed every single minute. I can’t say enough about our amazing Zoo. What a treasure, full of dedicated and passionate people. Special appreciation goes to Lexington Medical Center for the faithful support and huge banners. Thanks also to the Northwest YMCA for loaning the treadmill (they’ll have to forgive me if I avoid indoor cardio for a while). Most excellent and humble thanks go to everyone who donated for the penguins on Saturday! You have done a great service to the cause of conservation. Now I hope you’ll go a bit further… encourage all your friends and colleagues to donate as well. Together we’ll reach this goal!